We're here to help you incorporate library skills into your classes, as well as help you brush up on new tools that might be helpful for your own research. We offer: in-class workshops, customized research guides, one-on-one consultations, and much more. A clearly written assignment can go a long way toward helping students feel confident in the research process. It can also ensure your students are focused on developing the specific research skills relevant to your course outcomes. As you design/update your next research assignment, consider these resources. Have a favorite resource we haven’t listed? Please send it to us at library@assumption.edu so we can add it here. * "Truth Be Told: How College Students Evaluate and Use Information in the Digital Age," Alison J. Head and Michael B. Eisenberg, Project Information Literacy Progress Report, University of Washington's Information School, November 1, 2010. Start with your course goals in mind. How does the research project fit in with those goals? 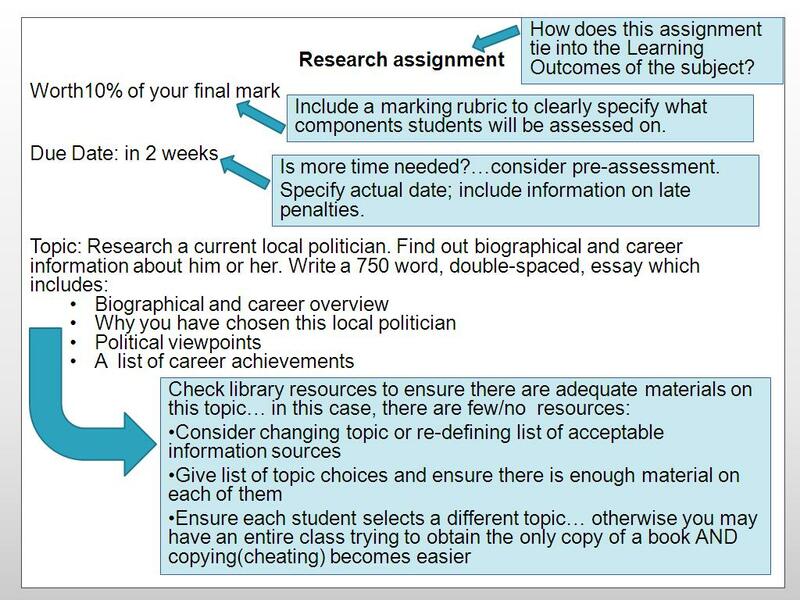 What type of assignment will best demonstrate a student’s attainment of those goals? What research skills will a student need to acquire in order to complete the project successfully? And how will you help them develop those skills? Do we have the library resources that students will need? Would Course Reserves be helpful, and/or will students need to allow time for Interlibrary Loan requests? Discuss the assignment in class. Many professors “scaffold” their assignments. For example, the first deliverable might require students to submit a tentative topic statement. Next, an annotated bibliography of potential sources. Later in the semester, a draft. Then finally the finished product at the end of the semester. Each of these checkpoints provides an opportunity to assess student understanding and preparedness. As you find gaps in student research skills, we can either help find resources or in-class activities for you to conduct in class to address those. And/or you can outsource this instruction by scheduling a library instruction session or referring individual students to us for a one-on-one research appointment. There are many resources out there with checklists or tips on crafting a well-written assignment. Advice includes being clear about expected page length, defining terms (if you restrict “online” sources, clarify whether you mean websites or if digital versions of academic articles are okay), and including a scoring rubric. An excellent step by step guide. What are the strengths? What are the weaknesses? 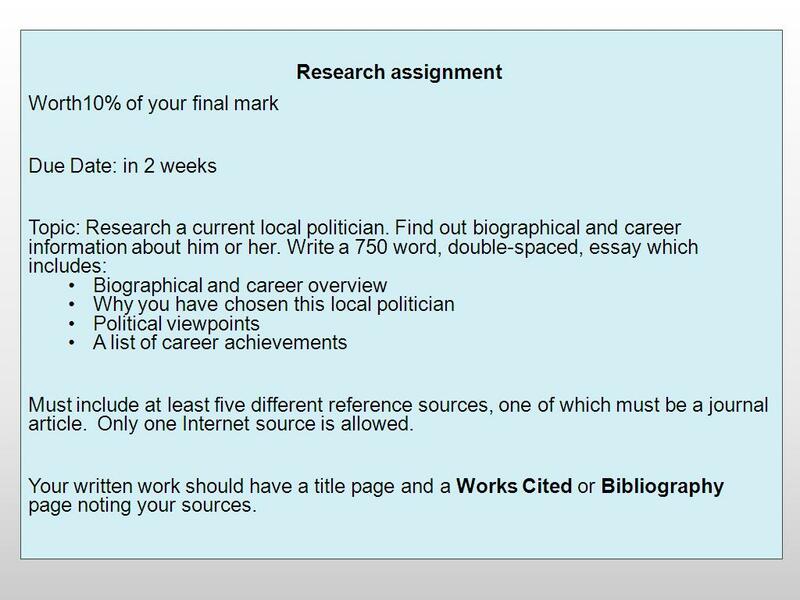 How can this assignment be improved? 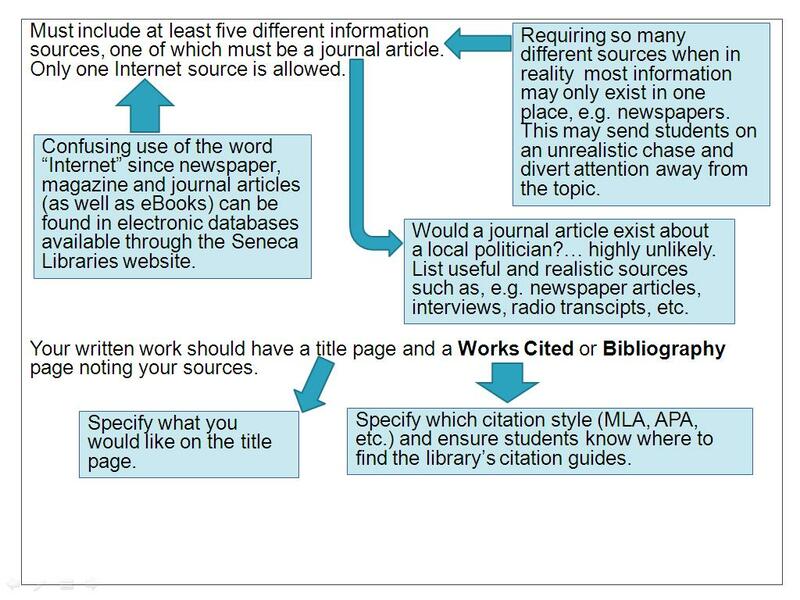 Let's next look at re-structuring some of the criteria required as information sources: From SPARK: Building Better Assignments by the Seneca Libraries.